Medium: Pen and brown ink, brown wash, heightened with white. Location: Fondation Custodia, Collection Frits Lugt, Paris. Mark 1:29–31 – As soon as they left the synagogue, they went with James and John to the home of Simon and Andrew. Simon’s mother-in-law was in bed with a fever, and they immediately told Jesus about her. So he went to her, took her hand and helped her up. The fever left her and she began to wait on them. 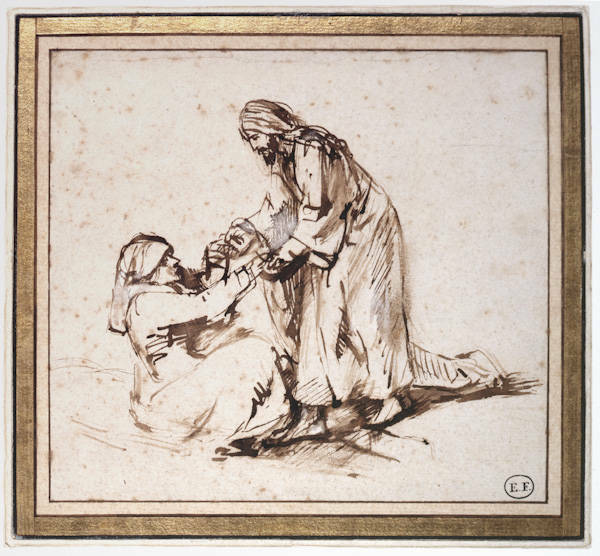 When making sketches to serve as models for his students, Rembrandt often focused on a story's protagonists — in this case, Christ and the convalescent woman — deliberately excluding any additional figures. Here he also refrains from making any reference to the setting, save for a few lively strokes to suggest the bed or blanket on which the woman reclines. Rembrandt's strategic placement of hatched lines and subtle smudging of ink create bold contrasts in light and shadow, which underscore the drama of the event. Rembrandt Harmenszoon van Rijn (July 1606 – October 1669) was a Dutch painter and etcher, generally considered one of the greatest painters and printmakers in European art history. Throughout his artistic life Rembrandt van Rijn produced between 300 to 600 paintings, approximately 300 etchings, and about 1400 drawings. The jury is still out on the exact numbers because in many cases it is not clear which works were done by Rembrandt himself and which were painted by his apprentices.